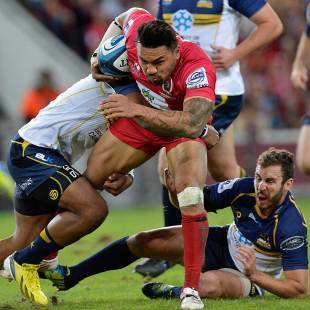 Queensland Reds have denied reports that Wallabies winger Digby Ioane is unhappy and plans to break his lucrative three-year contract at the end of the Super Rugby season. The Australian reported on Monday morning that Ioane was unhappy after being one of several players, including Horwill, taking issue over a third-party payment, saying the 34-Test winger was looking to move. But Reds director of coaching Ewen McKenzie and captain James Horwill both disputed the report, with the captain denying he was personally in dispute over any contractual matters. "That's completely untrue from my end," Horwill said. "I'd find it very difficult to play for another team other than the Reds, in Australia. I know Digby and, talking to him throughout the year, he loves playing for the Reds and loves playing for Australia. But in the end everyone has their own situation and must weigh up how they feel." McKenzie said he was unaware that Ioane, 27, had any problems, and he felt the report was typical of the player negotiation game. "I'm not too stressed about it. Digby is out there playing good rugby for us so I'm happy about that. There's some journalists out there who like writing speculative pieces without much substance so I will give it that much credence. You can't respond to everything written in the paper otherwise you would be very busy." Ioane signed his three-year contract with the Reds and the Australian Rugby Union, set to take him through to the end of next year, in late 2011. The Australian reported that Ioane may have to head overseas if he left the Reds, as ARU officials believed he has a binding contract to play for Queensland if he remained in Australia. Melbourne Rebels and Western Force may seek to sign Ioane if he can play in Australia, The Australian reported.